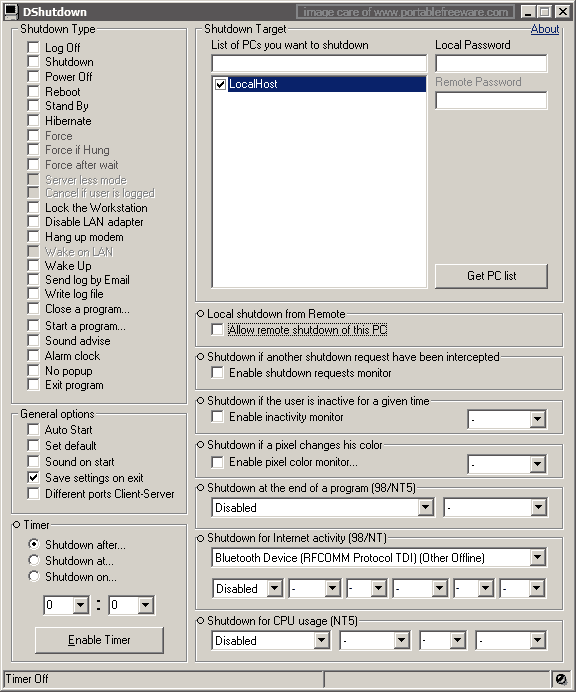 DShutdown is an automation program that allows you to perform variety of activities on either your computer or remote PCs. Functions include awaken, sleep, shutdown, close/open programs, alarms, lock, and more. Triggers include after a time period, program close (e.g. once file compression completes), activity monitor, network rate (e.g. when a large download finishes) and even monitor color changes. How to extract: Download the ZIP package and extract to a folder of your choice. Launch DShutdown.exe. I used that often on XP 32bit but on Windows 7 64bit it does crash. Guess this is because of 64bit, but I can't test this either. ESET always blocks with false positive! Teach that guy's that it isn't! When I run Avast anti-virus on this programme it tells me that it contains a Trojan Horse called Win32:Spyware-gen [Trj]. I'd definitely pick this utility over PowerOff. I like to schedule downloads on more than one application, so automatically shutting down in one program will interrupt the other. By using bandwidth monitoring in DShutdown this is no longer an issue. I tried Dshutdown on my network. It doesn't work. Apparently it makes alot of assumptions, i.e. certain ports being open,etc. Not recommended.